What’s in the Product’s Information Tab? When manually adding or editing product the very first tab you will be presented with is the product's Information Tab. This tab contains the basic settings for your product. Below is a brief summary of each of these fields. This is your product's unique identification number or store keeping unit (SKU) number. This can be anything you'd like and is used to display the product on orders, invoices and internal records of your store's product line. It can be a product's UPC code, or any number you use to identify your product internally. Up to 40 characters are allowed in this field. This field can be used for the product's Global Trade Item Number (GTIN) which is used to identify the product on several product feed services such as Google's Product Feed. This is the Manufacturer Part Number your product's manufacturer specifically uses for the product. It is an optional field, so if you do not know your manufacturer's unique ID, you may leave this field blank. However, if you'd like to use this identifier for the product, it is available to you. Up to 40 characters are allowed in this field. This is simply your product's display name. As with the ID/Sku number, it will also show on invoices and order information, but is a basically a friendly name you can apply to the product. If you have a list of Manufacturers created for your store (see Settings ->General ->Manufacturers), you can use this drop-down menu to specify a particular manufacturer for your product. Otherwise you can select "None" if this situation does not apply. If you have a list of distributors created for your store (see Settings ->General ->Distributors), you can use this drop-down menu to specify a particular distributors for your product. Otherwise you can select "None" if this situation does not apply. Here, you can assign the categories to which your product will apply. You can select single or multiple categories as needed. You can also use this section to remove the product from categories if necessary. This is the amount the product costs you to make or purchase from the distributor. This field is for internal information only and is not visible to your customers in any way. It is used simply for calculating your net profit based on your sales of the product. If available, you can place the retail price on the item if you wish. This can be used to compare the average retail price with your price and hopefully show your customers what they'd be saving when they purchase form you. This is how much you are selling your item for. The price you enter here, will be displayed to your customers on the live cart. This will be the price of your item when it is on Sale. To place the item on sale, simply check the checkbox located above the Sale Price field. These will be various pricing and display options you can apply to the product. This option is used if you want to make the product ineligible for tax charges. Enabling this option will allow the item to appear in your store, but will remove the ability to purchase it or add it to a cart. This can be useful for when you have a product that is out of stock or otherwise not being sold at that particular moment in time. This option will hide the item altogether from your store. Similar to the "Not For Sale" option, this option can be used if a product is out of stock and you don't want it displayed at all. Marking this option will display the product specifically on your home page. Think of it as a shop keeper displaying items in their window display. This setting will display the product at the top of its respective category as a featured product within the category. Marking this checkbox will essentially make the product "invisible" to searches made within your store. This area is used to set your product's weight and dimensions to be used with the shipping calculations specified in your shipping methods. This option is used if you'd like to add a specific cost to the shipping total in addition to whatever the shipping methods will calculate for the item in an order. For example, in the case of jewelry or high priced item, you may need to specify some sort of markup to the eventual calculated rate. Using the radio buttons provided, you can specify whether the product is packages in a single container or multiple boxes. Marking "One Box" will allow you to specify dimensional informaiton for the single box, and marking "Mult. Boxes" will allow you to enter dimensions for each box that the product uses. This will be your product's weight in pounds to be used for the shipping calculations. (fractional pounds can be used as long as they are listed in decimal format. The height of the product in its packaging to be calculated for shipping. Specified in inches. The width of the product in its packaging to be calculated for shipping. Specified in inches. The depth of the product in its packaging to be calculated for shipping. Specified in inches. Product dimensions are used by some shipping carriers to calculate shipping rates for the order, so it is usually best to have these fields populated as realistically as possible. This will apply free shipping to the product. However, please keep in mind that anything placed in the "Shipping" cost field noted at the top of this list will still apply to the product regardless of whether the free shipping option is toggled or not. This option is used for products that cannot be shipped in the same container as other items. For example, if you sell DVD movies as well as movie posters, the DVDs can be shipped in a regular box, but the posters are generally shipped in tubes. You would designate the posters as "Ships by itself." If marked, this checkbox will remove the product from the reward program altogether. This means that the product will not allow the shopper to accrue points (when purchasing the item). Typically, the reward multiplier set globally for the store will award points based on the monetary value of the product. The "Custom Points" field will allow you to specify a custom number of points awarded when the item is purchased. 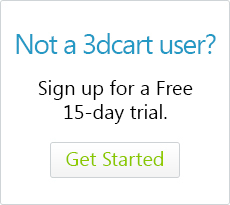 If you enable your 3dcart's Inventory Control functionality you will have an additional area where you can specify your Inventory Options for the product. This section of the product listing works in conjunction with Inventory Control in your store settings section. This will override the global Inventory Control specifications and display the product availability as "Out Of Stock" when it reaches 0. When the product is "Out Of Stock," the product will not be available for purchase. This will override the global Inventory Control specifications and display the product availability as "Back Order" when it reaches 0. When the product is on "Back Order" the product can be purchased by the customer - with the intention of receiving the product after stock is replenished. The number of stock you have on hand for the product. This field can be used to update the number of units in stock for the product. You can enter whole numbers or incremental numbers with this field. For example, if you have 90 units, enter a "90" and save the page to set your current stock. Then, if you get an additional shipment of 25 units, you can either enter the new total or "+25" to have the store update current stock to 115. Allows you to add a custom "In Stock" message to the individual product if desired. Add a custom message for when the product is on back order. The Custom Stock message fields will take basic HTML as well as dynamic variable tags available on 3dcart. This field can be used to enter more specific product information. This is the information that will appear on the product's individual listing. The contents of this field can be either regular text or HTML coding. You can also use the "What You See Is What You Get" or "WYSIWYG" editor to add HTML to this field. Within this field, you can specify keywords on the product that your customers can use to search for the item within your store. Keywords and phrases should be listed individually and separated by a comma. These will be areas where you can specify added features of the product. Custom Fields 1 through 5 will take regular text or basic HTML coding, whereas Custom Fields 6 through 13 will give you access to the aforementioned WYSIWYG editor. These are similar to the custom fields, but they will be displayed on the product's listing as a bullet list. Bullet points are not the only difference between Product Features and Custom Fields. Custom Fields are able to accept HTML coding while Product Features are not. Furthermore, Product Features cannot be used for sorting purposes like the Custom Fields can. On the back of most DVD movies, the packaging will list the actors, director, producers, and writers. These can be viewed as the packaging's "Custom Fields" as they are unique to this individual movie. The back of the DVD will also list features like audio commentary, chapter select, bonus features and trailers. These can be viewed as the packaging's "Product Features" since they are somewhat generic features available on just about any movie.